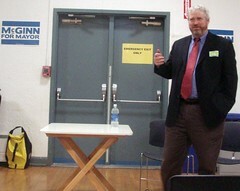 Mike McGinn speaks at Beacon Hill town hall meeting, September 19. Photo by melissajonas. Mike McGinn had a whirlwind day in Southeast Seattle. He started off in Columbia City, opened his new office near Othello Station, more in the ID, then to Jefferson Park Community Center at 8:00 pm. He was up-front about being tired, but made it clear he was happy to be in Beacon Hill. About 25 of our neighbors came to share their ideas with Mike. He was engaging, patient, and smart. He listened and responded thoughtfully. He does not seem like a politician. Will people vote for someone who doesn’t seem like a politician? I hope they do. Mike McGinn is working very hard to establish personal connections–he’s not slick or packaged. He’s honest about not knowing the answer to everything. Attending a McGinn event is a refreshing change from closely-managed rallies with talking points. Campaign volunteer (and Southeast Seattle community activist) Thao Tran introduced him by name, then Mike shared his personal history. He’s originally from Long Island, New York. His parents were both involved in public education: his dad, a school administrator, his mom a pre-K and Kindergarten teacher. Mike and his wife have three kids in Seattle public schools. Public education is very important to McGinn, on a personal level. He’s committed to improving the quality of Seattle public schools. 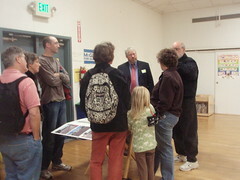 McGinn stayed after his presentation to review the North Beacon Hill neighborhood plan in progress. Photo by melissajonas. The Beacon Hill town hall topics included bringing jobs to the Hill, making it easier for small businesses (including home businesses) to survive and grow, making our parks safer and improving internet connectivity on the Hill and around the city. McGinn addressed concerns from two neighbors about a gun ban in parks violating civil liberties by saying that he supports the proposed ban because he believes it will make our parks safer. McGinn’s campaign is run entirely by volunteers. He rides his bike, takes mass transit, and relies on rides from supporters to get to events. He’s gotten the most press from his vocal opposition to a deep-bore tunnel replacing the Alaskan Way viaduct. Neighbors asked Mike about the tunnel and how he would do things differently. He laid out a clear, succinct argument. Google “Mike McGinn tunnel” to hear it. I was more interested in how he felt/what he thinks about all the other issues facing Seattle. We’ve heard a lot about how McGinn opposes the tunnel. It turns out McGinn supports a lot of other things: improving public schools, supporting neighborhoods, making Seattle safer, saving money, creating a broadband public utility, and lots of other things. His campaign established a website so you can share your thoughts: www.ideasforseattle.org. Are you registered to vote at your current address? Have you researched the candidates and the issues on the ballot? Be a good neighbor; be an informed, engaged voter. Attend meetings, read materials, talk to your neighbors. We are choosing a new mayor for the first time in eight years. This decision will shape our neighborhood for years–if not decades–to come. A lot of Seattleites have some, um, strong opinions about the way things went in this city during our recent “snow event.” If you’re one of them, Mayor Nickels wants to talk to you! The mayor is inviting city residents to talk about their winter storm experiences with him, and with department heads and city staff, as part of a citywide performance review of emergency snow operations. At the meetings, we’re told you’ll be able to talk one-on-one with the mayor, and also meet with staff from transportation, utilities and other departments.